Hannah and Anna share a passion for the power of maps in global health work. In relation to location-specific disease, disaster and social inequality, cartography and geography play an essential role in understanding and improving public health policy and planning. 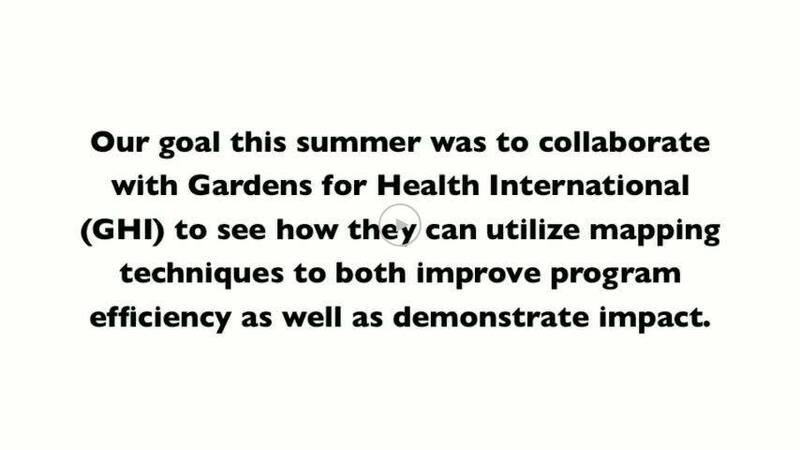 During the summer of 2012, Hannah and Anna collaborated with Gardens for Health International (GHI), a small grassroots organization in Rwanda, to produce maps and conduct trainings that will enable the organization to carry on similar work in the future. During their four weeks in the Gasabo District of Rwanda, they collected spatial data (a point location for every household GHI works with) and combined it with existing health indicators and information collected by the organization. This will allow GHI to reorganize their data and illustrate pattern in a more visually accessible way. Their $3,000 grant allowed Hannah and Anna to travel to Rwanda and to research this summer. They envision this project as a foundation for a larger undertaking—one that will develop a workflow for how small grassroots organizations can begin to incorporate GIS and other spatial analyses into their programming and organizational structure.